Dealing with Spiders in Your Home? I have been getting a lot of emails lately about spiders, more often than not the Wolf Spiders, people find in their houses. Well, 'tis the season I guess. It is that time of year when in many species, the males will start to wander, looking for a mate. Often while they are roaming about, with the weather cooling off, they are drawn to the warmer interior of our homes. There is also the problem of Garden Orb Weavers making their large round webs by windows or on porches. This is often a direct repercussion from leaving porch lights on in the evenings or leaving blinds open at night with lights on inside. Flying insects are drawn to the light. Flying insects are a good source of food for spiders. Especially Garden Orb Weavers who spin webs meant for catching flying insects. So where large quantities of flying insects are gathering, so comes the spiders as well. 1) Do not leave porch lights on. If you must, then look into bug lights. They are yellow bulbs that are not supposed to attract insects so much. Leave blinds closed while you have lights in the rooms on. 2) Spider repellent sprays. You can buy gallon size jugs that come with a thin hose and a spray gun attached at Home Depot or Lowes and such places. They are not meant to kill spiders but are used to keep them away. Spray around the perimeter of windows and doors every 6 to 8 weeks. 3) Search and sweep your basements and attics. Clean out any spider webs and egg sacks you can find. 4) When it comes to the Garden Orb Weaver, do not bother just breaking down the webs during the days. They will only rebuild it again. Often in the same place. Use a long stick and put it in the web while the spider is in the middle of it. Spin the web around the stick, trying to get the spider on the stick, then carry it to another place. 6) Do not sleep with blankets draping off the bed onto the floor. Remember, spiders tend to like crawling up and this often leads to them getting on the bed and biting someone who rolls over on them. Do these things, especially tips 1 & 2, and you will be surprised at how many fewer spiders you will see in your home during the Summer. what type of spider is this one. I'm very afraid of spiders and I'm 23 years old. Smh. A shame I knw, but my mom just got this house in west bloomfield,mi. So I need to be aware of these spiders also my mom ties her toy poddle to the back door and I'm afraid one of those big spiders my bite her or something anyway, I'm scared and would like to learn more about my fear to lessen it. Thanx. Enjoli 23. There is no reason to be ashamed of being afraid of spiders. Most people are to one extent or another. I have a blog on them, catch them and take pictures of them, and yet I have some fear of them myself. But the more I read about them, see pics of them, and deal with them personally, the less that fear has control. You really dont need to worry much about the dog being bit much less yourself. The spiders we have here in Michigan do not go out looking for people to bite. The only aggressive spiders we have are only aggressive when protecting their eggs. 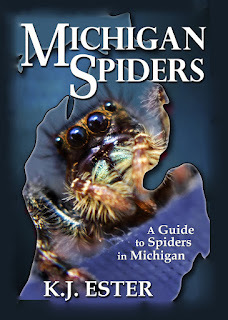 It is rare for someone to be bit by a spider in Michigan that causes more than a mild rash or mild swelling. Most dont do nothing more than cause some mild irritation that fades after a few minutes.